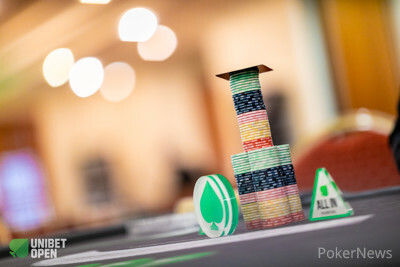 After three starting days and 10 levels each, the 2018 Unibet Open Dublin €1,100 Main Event has seen a field of 359 entries emerge at the Bonnington Hotel Dublin and 123 players remain in contention for the title, bragging rights and trophy that come along with it at the end of the 11th season of the popular tournament series. Once the cards go in the air at 12 p.m. noon local time, the payouts will be announced and best-positioned to join the champion’s club in the Irish capital is Finnish online qualifier Elias Vaaraniemi, who bagged up impressive 379,200 on Day 1a. In fact, the top three going into Day 2 were all at the top of the leaderboard already when the first of three starting days had wrapped, as Per Helge Gassand (367,000) and Henri Koivisto (330,500) follow in 2nd and 3rd place respectively. Former Irish Open champion and Unibet Poker ambassador Ian Simpson bagged up the most chips on Day 1b, claiming 284,200 to his name, and he is fourth in chips. Other notables with big stacks include John Keown (241,200), €2,200 High Roller champion Benny Glaser (207,400), UnibetPoker.fr ambassador Quentin Lecomte (159,400), Irish poker legend Mick McCloskey (142,900) and Day 1c chip leader Patrick Clarke (122,200). Unibet will have several other brand ambassadors heading into Day 2 such as David Lappin (107,000), Andrey "renyad" Yanyuk (90,600), Rauno "Estonian Jesus" Tahvonen (86,200), Lisa “STPeach” Vannatta (77,900), Dara O’Kearney (65,900), Alan "hotted89" Widmann (29,200) and two-time Unibet Open champion Dan Murariu (27,400). The action recommences with level 11 and blinds of 1,200/2,400 and a running ante of 400. A maximum of 11 levels of 60 minutes each or down to the final table are scheduled for penultimate tournament day, whichever of the two comes first. The PokerNews live reporting team will be on the floor to provide all the action and the live stream of the feature table will be available on a security delay of 30 minutes on the Unibet Open Twitch Channel.